Reliable Controls is pleased to announce the release of 902 MHz versions of the SPACE-Sensor™ EnOcean (SSE) and SMART-Sensor™ EnOcean Accesspoint (SSEA) products. This frequency communicates on the 902 MHz band for the North American market; the new versions of these products increase the effective radio frequency range and offer enhanced resistance to interference. The SSE and SSEA wireless devices can facilitate wireless EnOcean communication into any existing Reliable Controls MACH-System™ without the requirement of software upgrades. 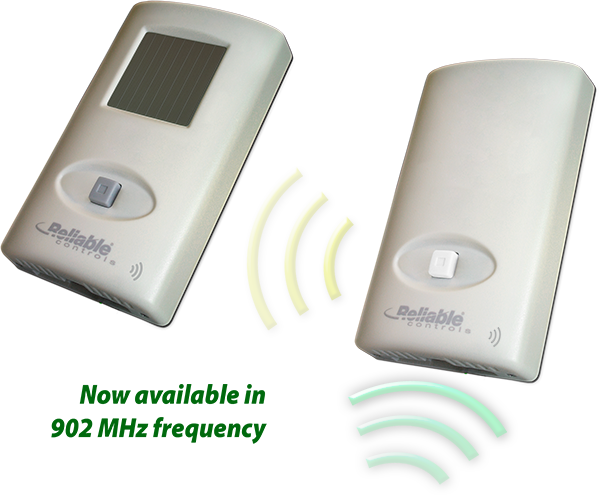 The SSE is a wireless and battery-less transmitter that resides in the occupant space, using a photovoltaic cell to convert solar energy into electrical energy that is stored in the device. A fully charged SSE will continue to function in complete darkness for up to 7 days. Transmission rates can be DIP switch selectable from every 10, 60, or 100 seconds. The new 902 MHz has superior radio range, signal strength, and propagation. Transmission distances can be from a maximum of 30 m (100 ft.) line of sight, or 10 m through five commercial drywall walls, 2 brick walls, or two aero concrete walls. The SSEA is a transceiver that connects directly to any Reliable Controls SMART-Net network. The SSEA can be added to any existing SMART-Net network and there is no need to upgrade firmware or software. Each SSEA can learn up to 18 different wireless points. Depending on the type of MACH controller used, 2 to 8 SSEAs can reside on the controller's SMART-Net. Additionally, the SSEA can accept many third party EnOcean products, including wireless relays, occupancy sensors, wall switches, card readers, and many other peripherals.